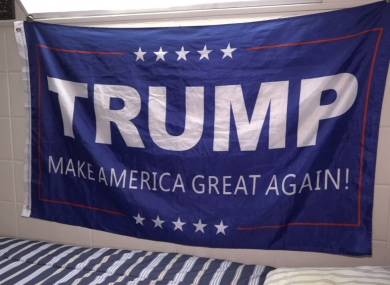 What is it like to be a Donald Trump supporter in US colleges? US universities lean heavily towards the Democrats. 'Active' conservatives are just 5% of the student body at Harvard. US UNIVERSITIES ARE often bastions of progressive Democrats, but Donald Trump’s election has spurred a growing number of conservative students to step out of the shadows and become increasingly vocal. Both voted for Trump, if for different reasons. But the keen debater says even though “actively involved” conservatives account for less than 5% of the student body at Harvard, Trump’s win has given them more of a platform to air their ideas. “Lots of people were wondering, ‘How did this happen? Who was it that voted for him?’” Long says. Dozens of students walked out in protest as Pence started to speak at the university in his home state of Indiana. Fuentes is an ardent Trump supporter and with a taste for the provocative, walks around Boston in “Make America Great Again” Trump campaign hats, even if it makes him a “pariah” by his own admission. He has spent his freshman year blending fact, opinion, current affairs and history into a program filmed in his small dorm room and shown by the Alabama-based Right Side Broadcasting Network, a conservative channel on YouTube. But neither Fuentes nor Long expect the conservative-liberal balance of power to change substantially on campus. Beard agrees — “not in the short-term,” he says. Marie Danziger, who has taught for 30 years at Harvard’s John F. Kennedy School of Government, believes conservative ideas are gaining ground even if conservative students and faculty remain in the minority. A rise in conservatism is also fueled by a growing number of active duty US soldiers or veterans on campus, as well as foreign students from countries such as China, Russia or Singapore, says the lecturer, who teaches a course on persuasion. “The other big change,” says Danziger, is a recognition “that we are as the one percent not universally loved by many of the people we will be leading in the future. “That means finding ways to either underplay our education or our left-leaning tendencies,” she said. Trump’s shock defeat of Democrat Hillary Clinton had left students asking themselves if there was “some way” they could learn from the billionaire tycoon. “What do we learn from Trump, but how can we use that in a way that we find morally and factually acceptable? This is the problem I am going to open my first class (with) in September,” she said. Email “What is it like to be a Donald Trump supporter in US colleges? ”. Feedback on “What is it like to be a Donald Trump supporter in US colleges? ”.